Size: Up to 5 feet or more (10 feet). Growth Form: Shrub or rarely tree; single stem, stems usually leaning southward on mature plants; depressed-spheric to ovoid-cylindric. Leaves: Leaves modified into spines emerging from areoles; lacking glochids; 16 to 25 spines per areole, the central spine is the largest with smaller radial spines dull pink, gray, tan and the smallest spines are white, slender and almost bristle like. Flower Color: Yellow, red or orange; large and showy, almost 2 inches long and 3 inches wide; inner tepals also orange, red or yellow with orange to red mid-stripes, stigma lobes yellow, orange or red; fruit bright yellow, readily dehiscent through basal pore, leathery or fleshy, hollow except for seeds. Flowering Season: July to September. Elevation: 300 to 5,500 feet. Habitat Preferences: Desert scrub, flats, bajadas, rocky areas, mountainsides, grasslands, south-facing slopes on lower edges of oak woodlands. Recorded Range: In the United States Ferocactus wislizeni is found in AZ, NM, TX. 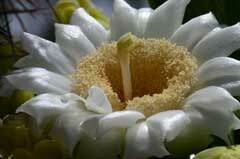 It is also native to northwestern Mexico. In Arizona it is found in the central and southern parts of the state. North America & US County Distribution Map for Ferocactus wislizeni. 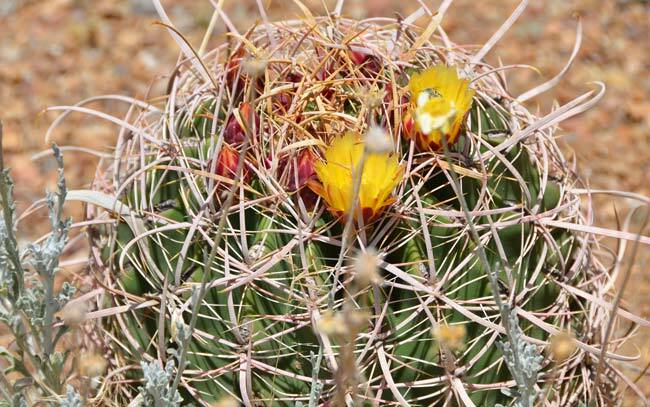 Threatened/Endangered Information: Arizona: Ferocactus cylindraceus is salvage restricted. Genus Information: In North America there are 6 species and 6 accepted taxa overall for Ferocactus. Worldwide, The Plant List includes 24 accepted species names and a further 149 scientific names of infraspecific rank for the genus. 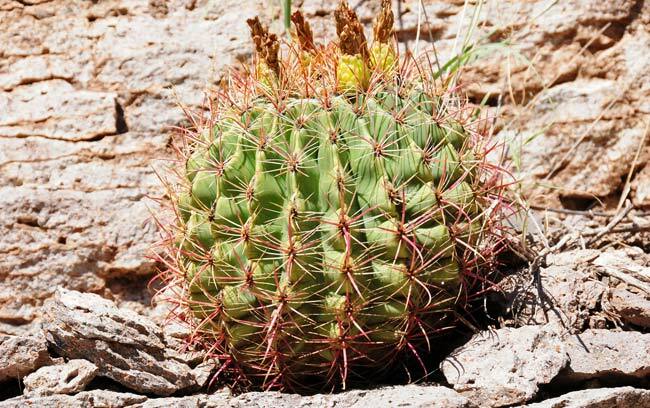 In the Southwestern United States: Arizona has 4 species of Ferocactus, California, New Mexico and Texas each have 2 species, Nevada and Utah each have 1 species. All data is approximate and subject to taxonomic changes. Comments: Candy Barrelcactus has a strong tendency to lean toward the south as adult and will often fall over pulling the roots out of the ground. Rotting plants play host to an entire ecosystem of insects and fungi. 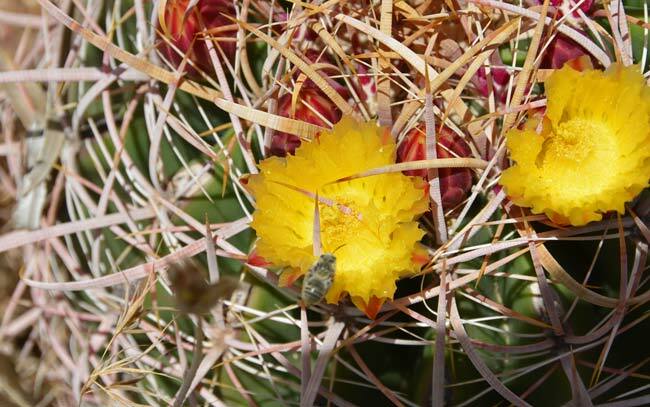 Another very large species of Barrel Cactus is Emory's Barrel Cactus, F. emoryi (covillei) which also blooms about the same time and has overlapping ranges. To date there is little or no documentation to suggest that this species hybridizes with California Barrel Cactus, F. cylindraceus however there are claims in the literature for claiming hybridization between these two species as an answer to confusion between identification of species in areas of overlap. Importance to Wildlife; Candy Barrel Cactus is eaten by Mule Deer, Javelina (sometimes called Collared Peccary) and livestock. Rabbits will eat the plants of the spines have been eliminated, especially through range fire. The seeds readily attract birds and small mammals. For a comprehensive thoroughly documented review of Ferocactus wislizeni see the USDA USFS Fire Effects Information System, or FEIS. In Southwest Desert Flora also see: California Barrel Cactus Ferocactus cylindraceus. Ethnobotany Ethno-Herbalist: Southern California Ethnobotany; Ethnobotany of Southern California Native Plants: Candy Barrelcactus, Ferocactus wislizeni. California Barrel Cactus has been used for food and traded by southwestern United States indigenous peoples. Apache, San Carlos Food, Beverage Juice used for extreme thirst. Apache, San Carlos Food, Porridge Small, black seeds parched, ground, boiled and eaten as mush. Papago Food, Beverage Plant tops pounded and the juice used as a drink. Papago Food, Vegetable Pulp eaten as greens in May. Pima Food, Beverage Juice extracted from pulp and used to quench thirst. Pima Food, Candy Used to make cactus candy. Pima Food, Substitution Food Pulp used in lieu of water for thirst. Pima Food, Unspecified Plants sliced, cut into small pieces, boiled with mesquite beans and eaten as a sweet dish. Pima Food, Unspecified Pulp cut in strips, boiled and used for food. Pima Other, Hunting & Fishing Item Thorns used to make fish hooks. Seri Food, Beverage Plant provided drinking water. Yuma Other, Hunting & Fishing Item Spines heated and bent to make fishing hooks. U.S. Dept. of Agriculture, Natural Resources Conservation Service on-line database and USGS ITIS search (accessed 07/28/2017). The Plant List (2013). Version 1.1. Published on the Internet; http://www.theplantlist.org/ (accessed 07/28/2017). Allan D. Zimmerman & Bruce D. ParfittFNA FNA | Family List | FNA Vol. 4 | Cactaceae | Ferocactus 1. Ferocactus wislizeni (Engelmann) Britton & Rose, Cact. 3: 127. 1922.; Flora of North America Editorial Committee, eds. 1993+. Flora of North America North of Mexico. 16+ vols. New York and Oxford. Matthews, Robin F. 1994. Ferocactus wislizeni. In: Fire Effects Information System, [Online]. U.S. Department of Agriculture, Forest Service, Rocky Mountain Research Station, Fire Sciences Laboratory (Producer). Available: http://www.fs.fed.us/database/feis/plants/cactus/ferwis/all.html [2017, July 30]. Native Plant Information Network, NPIN (2013). Published on the Internet http://www.wildflower.org/plants/ [accessed: 07/28/2017]. Lady Bird Johnson Wildflower Center at The University of Texas, Austin, TX.